Mali has been absorbed since the beginning of 2012 in a worrying situation : a new Tuareg rebellion in the north of the country claiming to free the region called Azawad, the noticed presence on the territory of armed salafist groups, the realistic threat of a famine in the Sahel, dozens of thousands of Malians displaced because of the battles between Bamako and the Tuareg (for an overview of the situation, refer to the first semester Monitoring). Unexpected consequence of this explosive situation, a commando unit led by a certain Amadou Sanogo overthrew on March 22 the Malian president Amadou Toumani Touré (usually called ATT), who would have retired from politics the day of the pre-planned presidential elections on April 29. The reason : his weakness in front of the Tuareg rebellion of the MNLA (Mouvement National de Libération de l’Azawad) which, since January, has multiplied the victorious attacks in the north and has seemed to be in a good position to conquer the main cities of the region. Facing these defeats, the army felt abandoned by Bamako, helpless, and wished to take back the power to fight against the risk of the country’s partition. 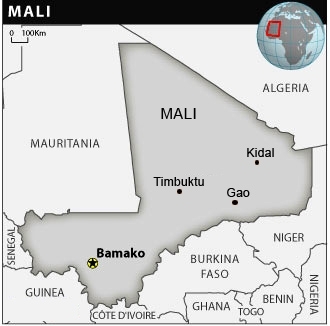 Ironically, it is during the few days of the junta’s power that the situation became worst in the north of Mali. At the end of March and the beginning of April, the MNLA claimed having control over strategic cities such as Kidal, Gao and Timbuktu, being thus in control of half the country. The movement even declared the Azawad independence on April 6, although nobody recognized it. And as if the situation was not enough critical, different armed salafist groups also asserted being in control of these cities. First of all, Ansar ed-Dine (“the religion defenders”), a Tuareg islamist movement which demands the application of the Islamic law in the north of Mali. Conducted by the famous Iyad ag Ghali, former chief of the Tuareg rebellions of the 90’s then mediator for the Malian state during the negotiations with AQIM, the fighters paraded in the streets of Timbuktu the day of its fall, April 2. Soon after, the AQIM presence has been noticed with the apparition of the chief Mokhtar Belmokhtar in Gao then Timbuktu. Followed the diffusion of diverse information, reporting the two movements alliance in their new role of extremist Islamic chiefs : closing bars, fire of churches, pillages. News one has to consider carefully given the chaotic situation of the region, closed to journalists. In addition there was the arrival of another jihadist group named MUJAO (Mouvement pour l’unicité et le jihad en Afrique de l’Ouest) which has claimed the kidnapping of Algerian diplomats in Gao on April 8. Finally, members of Boko Haram, a Nigerian islamist sect which terrorizes Nigeria, were also seen in the region. A blurred and explosive situation which alerts the neighboring and western countries wishing to preserve the territorial integrity of Mali and to fight against the implementation of the islamist threat in a desired region. ECOWAS (the Economic Community of West African States) took charge of the problem as soon as the putsch was official on March 22. Financial, diplomatic and economic threats were quickly made against the mutineers, added to the threat of the intervention of an armed force to restore the Malian constitutional order. Aware of his weakness and isolation, Amadou Sanogo, the junta’s chief, finally gave back the power to the civilians with the signature of an agreement with ECOWAS on April 6, which guarantees amnesty to the soldiers involved in the putsch. Dioncounda Traoré, President of the Malian parliament at the time of the putsch, was declared President ad interim on April 12, according to the country’s Constitution. On April 17, he appointed the famous astrophysician Cheick Modibo Diarra as Prime minister to conduct the transition. A semblance of constitutional order’s return is then perceived in Mali, with a Prime minister with full powers after almost a month of a major political crisis. Cheick Modibo Diarra is now facing some huge challenges : the restoration of the government’s authority in the north of Mali, the fight against the islamists and independentist Tuareg, the strengthening of the army capabilities, the organization of the refugees’ return and of course the organization of convincing elections. It will be done with the help of a successful ECOWAS which still plans to send an armed force in Mali, this time to fight the armed groups. And of course with the help of the allies of Mali, notably France, which, despite its refusal of interceding militarily in the country, however mentioned the possibility of a logistic help to ECOWAS. Yet, even if the junta has officially given back the power, it appears that they want to reaffirm its role in the transitional government. Some close aides to ATT as well as some military chiefs have been arrested since Monday by junta’s ex-soldiers, and apparently detained in the military camp of Kati, near Bamako, former junta’s fief. No official declaration has been made by Amadou Sanogo. Thereby, the constitutional order does not seem truly restored in Bamako, increasing the fear of a new degradation of the situation in the north, due to the absence of a clear policy.